I hope that everyone had a wonderful Thanksgiving. We have so much to be thankful for! We were going to my mom's house for Thanksgiving. My husband, Dustin likes to play the "Turkey Bowl" with some buddies, and took off in the morning, leaving me with the job of getting food, house, and kids ready for the day. I underestimated how long it would take me and was a little slow getting the kids and I out of the house and headed for my mom's house. As organized as I seem to be, even I need to take the time to remember to ask for help now and again. My sister offered to help and being a bit proud I declined. I should have just swallowed it and accepted her services. List Making. I know that this seems basic, but the list I created to help me remember what to take with me to my mom's house for Thanksgiving saved me! I had everything on it from my son's highchair to his sippy cup. Sometimes the most basic things can be forgotten, creating in my case irritation. So it may have taken me a while to get out of the house, but at least I remembered everything. It was great!! Now go get organized! The weekend is almost here. It's my chance to relax a little after a busy week of being a mom, keeping house, running errands, doing bills, and working. Sound familiar? I've been thinking about things I could talk about that might help you simplify your life. And I know for myself that one of the biggest drags is trying to keep my house maintained amongst my other projects and activities that fill up my days. So I'm going to give you some easy hints throughout the year that will help you "Spring Clean" and organize your home without making you feel overwhelmed. I love lists. I've created a list specifically for Spring Cleaning projects. In my home I focus on a specific room of the house each month so that I'm not overwhelmed. Because this month is almost over we'll start in December with a bedroom. 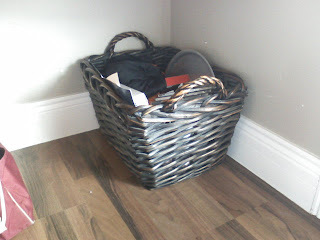 A lost and found basket is a great way to keep things organized that don't belong to you. I have a basket in my kitchen that has items that people have left at my house when visiting. I also have items that need to be returned to the store or items that I am giving to other people in the basket also. It looks nice and is fully functional. Just don't forget to grab those items when you are meeting up with people or heading to the store. If you don't want to buy a basket, a bin or cardboard box would serve the same purpose. Now go get organized! Well everyone, I'm going to start my weekly Time Saving Tip of the Week starting next Friday, so stay tuned. 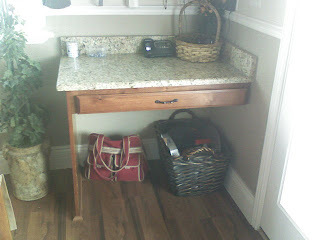 I will be posting a new time saving tip each Friday for those who want to get organized in easy, inexpensive ways. As many of you may know, I am a coupon cutter and enjoy saving money where I can. I was looking over my coupons last week and seeing that some of them were going to expire, I decided to separate and use the ones that I really liked. Because it's the holidays, and one of my favorite things to eat during this time of year is Muddy Buddies, I decided to use my Chex cereal coupon. I have never seen Chex go on sale during the last five months that I have been shopping. So I went ahead, bought the cereal at full price and used my coupon. At least I felt better about that. Yesterday I went shopping again. Of course Chex cereal was on a seriously great discounted price of $1.50 a box!! Can you believe that? I bought nine boxes (three of each kind). That's my luck! The sale happened one week after my coupon expired. Oh well! As part of my business I create recipe card creations. I put recipes on darling, fun backgrounds and print them out on 4x6 card stock and make books of peoples favorite recipes. 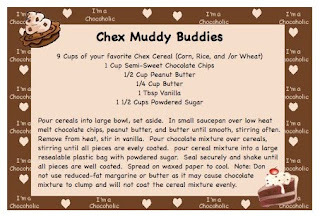 In case you aren't familiar with the Yummy Muddy Buddy Recipe you should definitely try it. So here it is! Just click on the image to make it larger, and printable. Thanks! My blog is currently under construction so please bare with me. I am very excited to share my business ideas with everyone. I have a couple of goals in starting this business. I love to organize so my first goal is to help people become free of the clutter that surrounds their lives. I also want to help people create and save their memories. I want to help others create a way to save dimples in time. Why Dimples in time? Well, isn't that what time is? Every moment of every day, we create a dimple in time. What we do with those moments is up to us. I for one want to get the most out of my time, so being organized saves me time and hassle every day, leaving me more time to do the things I want. Scrapbooking my photos and other meaningful items allows my family and I to remember the moments that were so important to us…those dimples in time! So come back and visit often for great organizational tips and ideas!